My Parents were Hindus and worshipped Hindu gods and goddesses. I too grew up in the Hindu family worshipping Idols. My mother was first given the gospel by the worker working in my house. She is the first in my family to accept the Lord and she use to take us to the church and made us memorize all the verses in the bible. Then after that I gave my life to the Lord in the year 1989 and was baptized. My father Murthy has also given his life to the Lord and he too was also baptized. My younger brother Ravi has also accepted the Lord and then he too was baptized. It was in the same year 1989 my mother Savithri suffered with terminal cancer. She was almost in her death bed. We prayed to the omnipotent God to heal her. While praying God healed my mother completely and even though doctors said that she is going to live for not more than 7 days. God blessed her and heard our prayers and she lived for 22 years. She went to the Lord in the year 2011 on Feb 3rd. She was a great help in SAC Ministries. Subsequently the Lord called me for his ministry by showing me the scriptural verse in the Bible from Jeremiah 1:4-5:- The word of the Lord came to me, saying, Before I formed you in the womb I knew you, before I formed you in the womb I knew you, before you were born I set you apart. I appointed you as a Prophet to the nations. I obeyed immediately and started preaching in villages, slums areas, open air preaching, and track distribution. At that time I was 15 years old and I have just finished my 10th grade. In the year 1989-91 I have completely my 11th and 12th grade studies and I enrolled in the engineering curriculum when I moved from Visakhapatnam City to Vijayawada City. I think that it is the perfect will of God not only to pursue my engineering studies but to also work among the people in Vijayawada City. I was born in the year 1972 November 23rd. In the year 1993 November 23rd on my birthday the first church of SAC ministries started. As a student and also as a Missionary, with the help of The LORD, I reached the unreached Hindus the high caste and also the Low caste Dalit People. While I was studying I saved my meal money and put it towards the ministry by purchased an amplifier and other equipment needed to preach the gospel and minister. When I proclaimed the love and power of God working among these people they changed their lives and accepted Jesus as their personal Savior. While I was still studying engineering 2nd year in the year 1993 my heart was filled with burden for perishing souls and my first ministry started in the slums of Vijayawada as an open air preacher when I preached word with fasting and tears. The word of God worked in the hearts of people by the power of Holy Spirit. Many who were in the clutches of sin were delivered and transformed by the power of God. Jesus helped me to start the first church called Sion Assembly Church in the year 1993 November 23rd at that time I was 21 years old. In addition to street preaching I used to work in the hospitals and prisons. 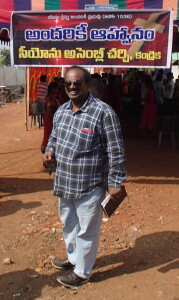 It was God’s plan for us to minister in Andhra Pradesh, India. For last 22 years. I have no words to explain how the lord worked in me and helped me to establish 6 other Churches. God has given us a fine team of dedicated men and women working with us in his field in spreading the Gospel. Thus, God has surely proven his faithfulness by blessing the Sion Assembly Church Ministries in very many remarkable and tremendous ways. And it pleases my Lord to use me as a revival preacher in many student retreats, gospel crusades and also in pastors conferences. Our hearts are overwhelmed with joy when we see many souls joining the churches and our churches are packed with people. They are blessed by Sion Assembly Church Ministries and we are richly blessed by them. Sion Assembly Church Ministries has been provided by God with many ways of winning souls. Some are soothed by providing medical assistance and drawn towards God. Some are touched by tracts and personal evangelism. All these methods are adapted and implemented by us to bring forth lives for Christ. We organize open air tours, street preaching, skits, campaigning etc., and gather people to conduct crusades in the remote areas and seminars to the pastor and evangelists working among people in rural tribal and un-reached places. These are just a very few things in soul winning process for which we give God all honor, Praise and Glory. Standing on the promises of God in the Bible we are going forward in the ministry. We give all the honor and glory to the Lord who called us to accomplish His mighty things. And it is still a wonder how the Lord is helping us to meet all the financial needs. We are located in a very poor area but the Lord is blessing the humble offerings of the people who are blessed by this Sion Assembly Church Ministries. About our Orphanage it was started with a great burden in the year 2009 with 2 children now we have 22 children. When I have seen my children in the church suffered with not having one of their parents or both and some of them died with AIDS and they were treated very badly in the community. In the schools other children would not play with them and treat them very badly. God put a burden on me to take these orphan children and provide them with food, 3 meals a day, clothing and shelter where they can sleep on a bunk bed with a good mattress and a good pillow. We send them to school and, more importantly, we also train them in the ways of the Lord JESUS.